At Slate, Phil Plait notes a new paper that finds the Antartic is losing 159 gigatonnes of land ice a year. How does that compare to the increase in Antarctic sea ice, a favorite talking point of [fake] skeptics? A new paper in the Journal of Climate models Antarctic sea ice and finds it increasing by 30 km3/yr. (There may, though, be problems with the algorithm that calculates the daily sea ice number; more on that here.) Since sea ice has a density of about 870 kg/m3, that's a gain of about 26 Gt/yr. Note: that's only 1/10th the amount of loss in Arctic sea ice. Over a teratonne a year. So unless the frozen bus stop puddles of the world are gaining over a 1,000 gigatonnes of ice a year -- doubtful even in Canada -- the world is definitely losing a lot of ice. And Greenland's loss is accelerating. Sources: McMillan et al, Holland et al, PIOMAS, Enderlin et al, Gardner et al. 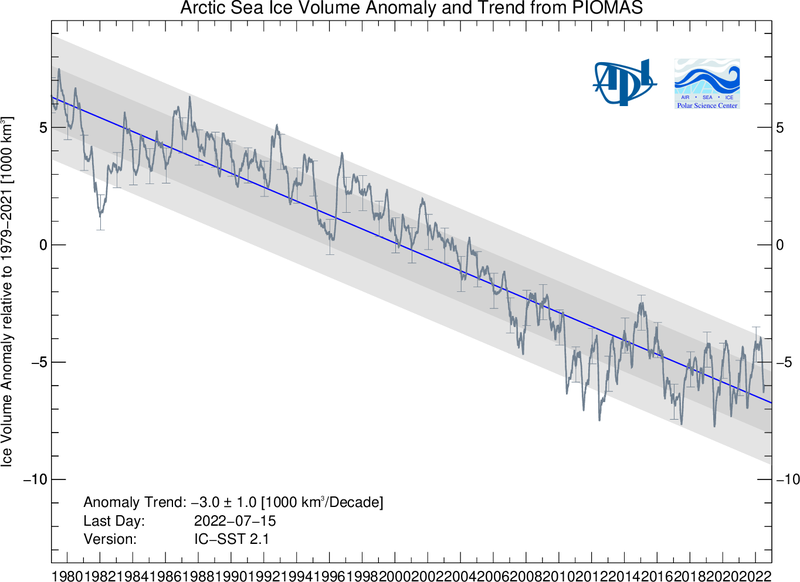 Correction 5/28: PIOMAS number changed from -300 Gt/yr because, while the volume change is -300 km3/yr, I didn't multiply by the density of sea ice to convert it to mass. Yeah! Human extinction ahead! Time to exterminate the vermin from the face of the Earth! Too bad everything else will be dead before we are. Seems as if there is no justice in the Universe. Well ain't you just Little Mary Sunshine. Oh well. Not everybody can do math. The Holland study that you quote here says Antarctic sea ice increases by 20,000 square km a year. All the other studies say it increases by 200,000, not 20,000 (because it's 1% of 20 million square km, and all the other studies say Antarctic sea ice increases by 1% a year). So it looks like Holland dropped a digit someplace. So much for the peer review process. It's also increasing in thickness. Morgan: Which "all the other studies" are you referring to? for both poles. When you download it and calculate the trend of Antarctic SIE, it comes to about +22 Kkm2/yr, in agreement with Holland et al.